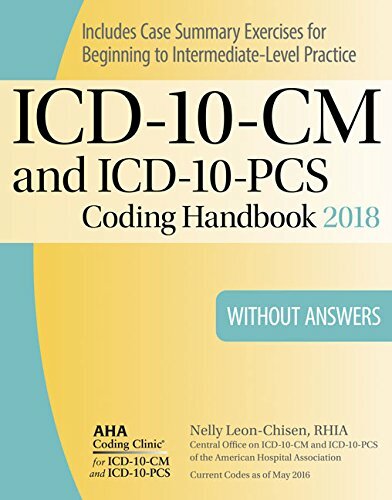 155648433X - ICD-10-CM and ICD-10-PCS Coding Handbook, without Answers, 2018 Rev. Ed. 155648433X – ICD-10-CM and ICD-10-PCS Coding Handbook, without Answers, 2018 Rev. Ed. 155648433X -The ICD-10-CM and ICD-10-PCS Coding Handbook is the only guide published in collaboration with the Central Office on ICD-10-CM/PCS (formerly Central Office on ICD-9-CM) of the American Hospital Association. ICD-10-CM and ICD-10-PCS are the HIPAA code sets that replaced ICD-9-CM in the U.S. on October 1, 2015. Appendix C contains a complete workbook of case-summary exercises for more advanced practice. The case-summary exercises are based on actual health records and require readers to consider the patient s condition as well as medical history, reason for admission or encounter, laboratory results, procedures performed, and the diagnoses listed. Readers must apply pertinent coding principles and official coding guidelines in making code assignments and designating the principal diagnosis and procedure for each episode of care.